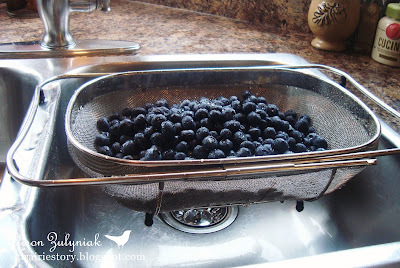 Now that summer is here, I'm finding I'm washing, rinsing and drying off more fresh fruits and veggies! Which is good enough reason to pull out my expandable over-the-sink strainer that straddles the sink. It has a large stainless steel basket and rubber feet to reduce slipping and then can be easily placed on the counter top. So much easier than trying to use a smaller strainer that I then have to find a bowl to balance it on. Next... what to do with all these blueberries! Sorry to post this here, Alison, but I couldn't find your email. You asked about the vegetable pie that I posted a picture of. I got the recipe from my Mom and it turns out that it's just her personal variation on the Bisquick recipe! I posted it today, because Bisquick or not, it's still darned good!